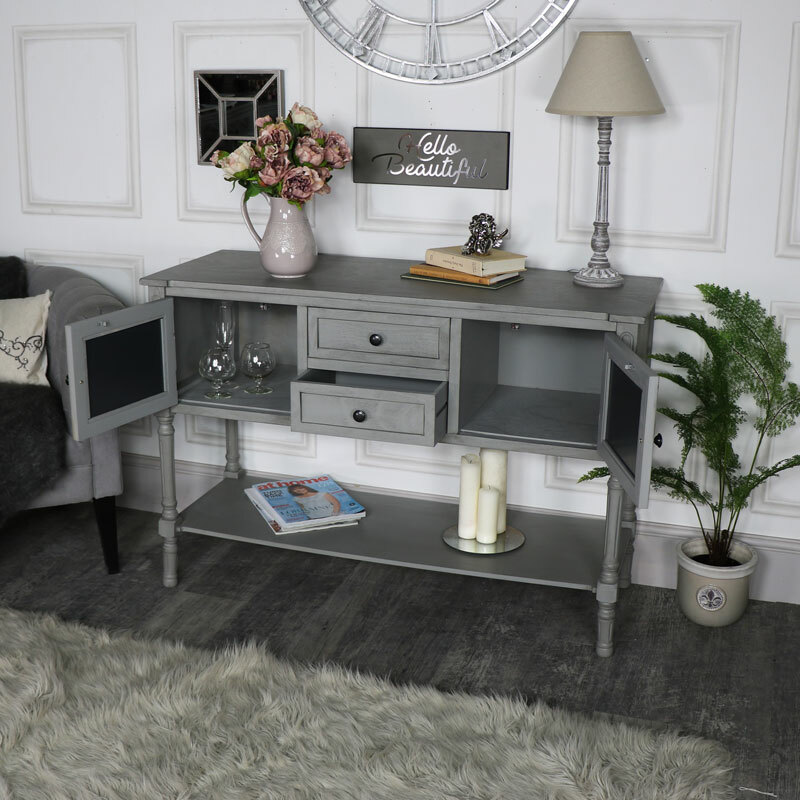 Large Grey Mirrored Sideboard Storage – Vienna Range DAMAGED SECOND 1045 Large surface space on top for any ornaments and floral decorations you want to display. Two cupboards on either side for great storage and 2 small drawers in the centre for bits and bobs. The shelf underneath adds even more surface space. This sideboard will be perfect for displaying ornaments or floral arrangements, with an understated elegance that does not overpower the room but adds to it with the mirrored inlays on the cupboard doors, gracefully highlighted with the ornate latticed detailing on the front. 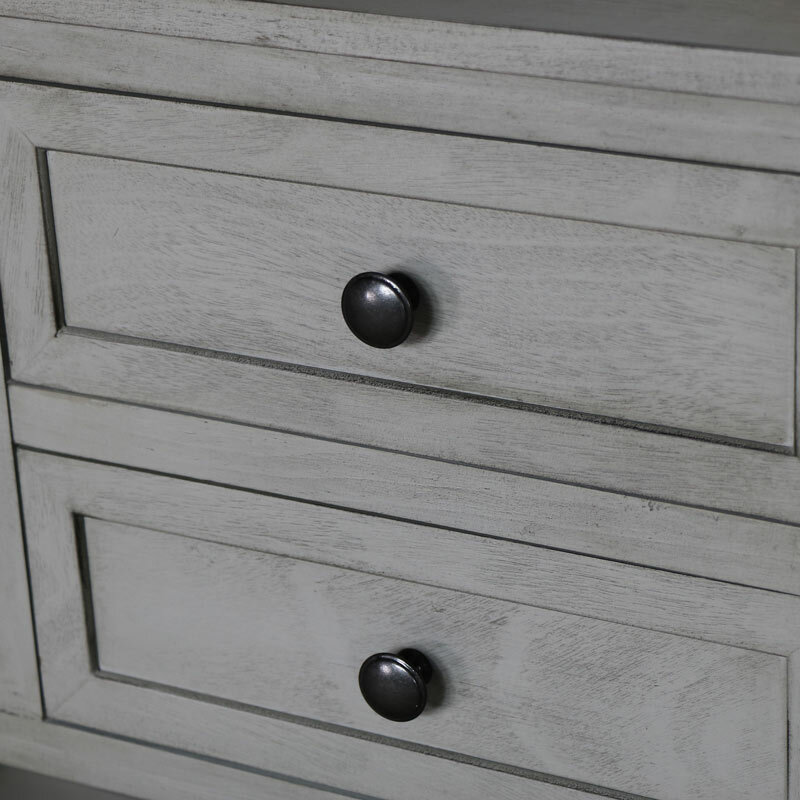 The overall look is completed with small round brass door knobs on the cupboards and drawers. Large surface space on top for any ornaments and floral decorations you want to display. Two cupboards on either side for great storage and 2 small drawers in the centre for bits and bobs. The shelf underneath adds even more surface space. 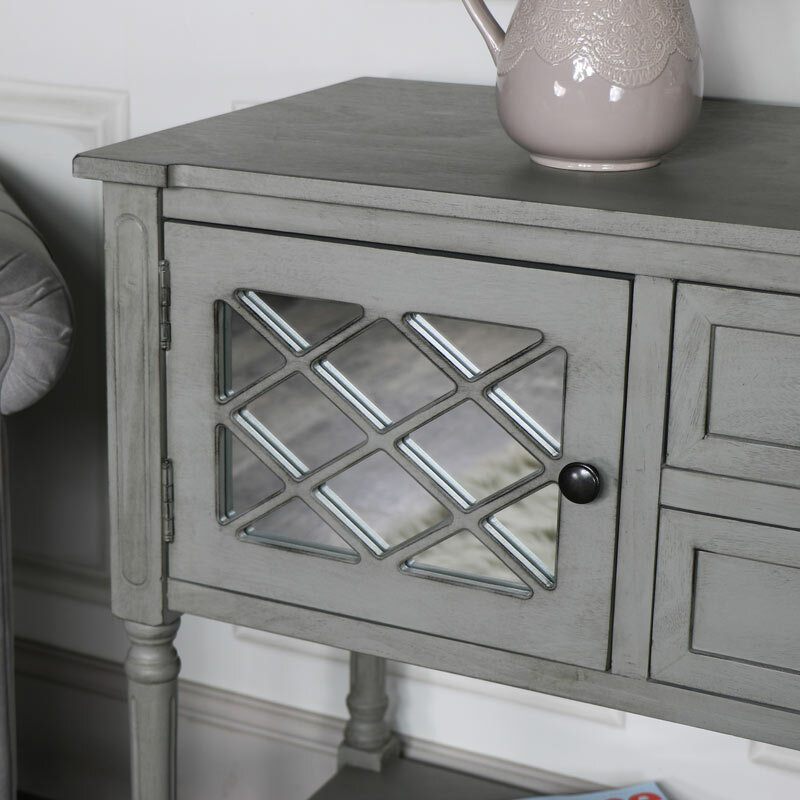 This sideboard will be perfect for displaying ornaments or floral arrangements, with an understated elegance that does not overpower the room but adds to it with the mirrored inlays on the cupboard doors, gracefully highlighted with the ornate latticed detailing on the front. The overall look is completed with small round brass door knobs on the cupboards and drawers. 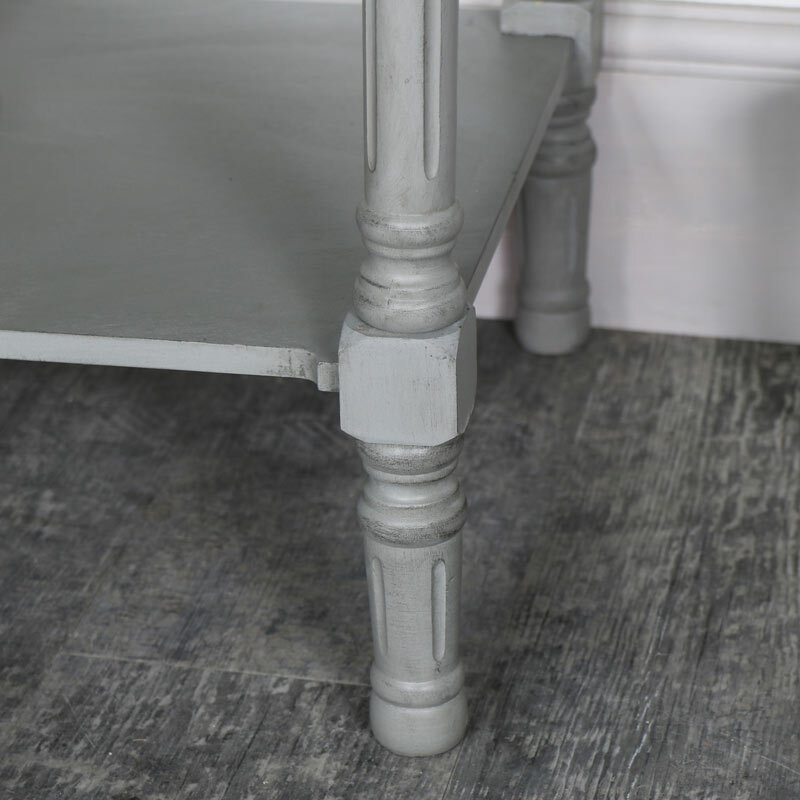 Made from wood in a slightly distressed pale grey finish. 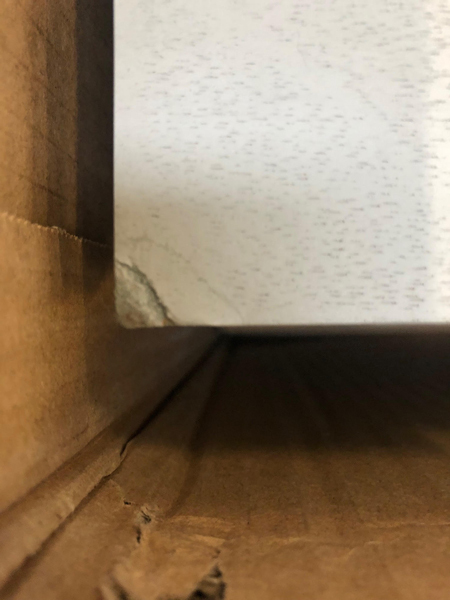 The cupboard doors both have a latch fastener that keeps the doors securely closed. 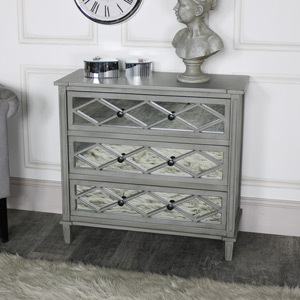 In a sturdy design, the overall measurement on the sideboard is 116cm x 79.5cm x 45cm (width x height x depth). The cupboards measure 36.5cm x 28.5cm x 38cm and the drawers measure 30.8cm x 11cm x 35.4cm (width x height x depth). 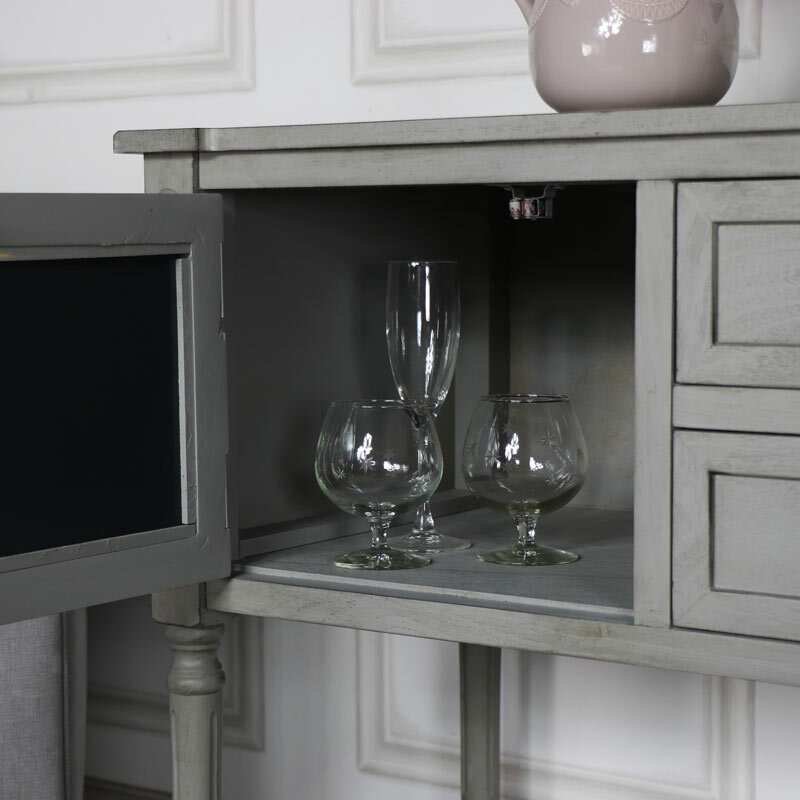 The sideboard comes fully assembled so no need for fiddly instructions and time spent putting it all together, just unbox and place where you want. 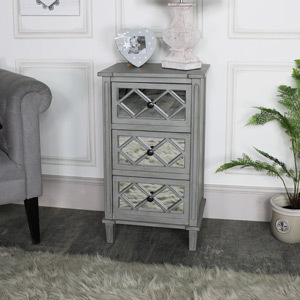 We have more furniture available in the Vienna Range, with a chest of drawers, cupboard unit, console table and small bedside/lamp table, so you can create the style and living space that suits you.